'Black Dog' is a song by English rock band Led Zeppelin, which is featured as the lead-off track of their fourth album, released in 1971. It was also released as a single in the US and Australia with 'Misty Mountain Hop' on the B-side, and reached number 15 on Billboard and number 11 in Australia. Led Zeppelin bass player John Paul Jones, who is credited with writing the main riff, wanted to write a song that people could not 'groove' or dance to with its winding riff and complex time signature changes. The song's title is a reference to a nameless black Labrador retriever that wandered around the Headley Grange studios during recording. The dog has nothing to do with the song lyrics, which are about desperate desire for a woman's love and the happiness resulting thereby. Regarding the lyrics to the song, Plant later said, 'Not all my stuff is meant to be scrutinized. Things like 'Black Dog' are blatant, let's-do-it-in-the-bath type things, but they make their point just the same.' Plant's vocals were recorded in two takes. Page's solo was constructed out of four overdubbed Gibson Les Paul fills. The sounds at the beginning of the song are those of Page warming up his electric guitar. He called it 'waking up the army of guitars' — which are multitrack recorded in unison with electric bass guitar to provide the song's signature. 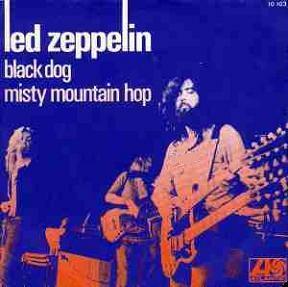 'Black Dog' became a staple and fan favourite of Led Zeppelin's live concert performances. It was first played live at Belfast's Ulster Hall on 5 March 1971, a concert which also featured the first ever live performance of 'Stairway to Heaven'. It was retained for each subsequent concert tour until 1973. In 1975 it was used as an encore medley with 'Whole Lotta Love', but was hardly used on the band's 1977 concert tour of the United States. It was recalled to the set for the Knebworth Festival 1979 and the 1980 Tour of Europe. For these final 1980 performances, Page introduced the song from stage. When played live, Led Zeppelin often played the first few bars of 'Out on the Tiles' as the introduction for 'Black Dog', except for the 1973 tour where the riff from 'Bring It On Home' introduced the song. Also, the 'ah-ah' refrains were sung in call-and-response between Robert Plant and the audience. Page's guitar playing prowess is well demonstrated in different recorded performances of the song from Madison Square Garden in July 1973, as seen in the group's concert films The Song Remains the Same and Led Zeppelin DVD. There is also a June 1972 live recording of 'Black Dog' which can be heard on the album How the West Was Won, and another live version on Disc 2 of BBC Sessions. 'Black Dog' was performed at the Led Zeppelin's reunion show at the O2 Arena, London on 10 December 2007. Plant sampled the song on his solo tracks 'Tall Cool One' and 'Your Ma Said She Cried In Her Sleep Last Night'. Jimmy Page and Robert Plant performed an updated version of this song on their 1995 tour. 'Black Dog' was the first song performed by Page and Plant at the American Music Awards, which kicked off their first tour together in almost 15 years. Robert Plant also played a version of the song during his solo tour in 2005, as is included on the DVD release Soundstage: Robert Plant and the Strange Sensation. Whitesnake overtly based 'Still of the Night' on this song; later, when Coverdale-Page toured in 1993, they played both songs together. Robert Plant and Alison Krauss regularly covered 'Black Dog' during their tour of USA and Europe in April and May 2008. It also features on their appearance on the Country Music Television show CMT Crossroads, recorded in October 2007. ↑ Lewis, Dave (2012). Led Zeppelin: From a Whisper to a Scream. London: Omnibus Press, 52. ISBN 978-1-78038-547-1. ↑ Crowe, Cameron (13 March 1975). "The Durable Led Zeppelin". Rolling Stone (182). ISSN 0035-791X. Retrieved on 19 April 2014. ↑ Led Zeppelin Database - Studio Vaults. Argenteum Astrum (25 March 2014). Retrieved on 19 April 2014. ↑ Lewis, Dave (2003). “The Making of Led Zep IV”, Led Zeppelin: The 'Tight but Loose' Files: Celebration II. London: Omnibus Press, 22. ISBN 978-1844-49056-1. ↑ Gracyk, Theodore (2007). Listening to Popular Music, Or, How I Learned to Stop Worrying and Love Led Zeppelin. Ann Arbor: University of Michigan Press, 166. ISBN 978-0-472-06983-5. ↑ Lewis, Dave and Pallett, Simon (2005). Led Zeppelin: The Concert File, Revised. London: Omnibus Press, 130. ISBN 978-1-84449-659-4. ↑ Sparaco, Gerard (2 January 2011). Robert Plant & Alison Krauss – Your Long Journey (Wardour-063). Collectors Music Reviews. Retrieved on 19 April 2014. ↑ Staff writer (15 January 2008). Robert Plant and Alison Krauss: 'Cmt Crossroads' to Premiere Next Month. Blabbermouth.net. Retrieved on 19 April 2014. ↑ ROCK SONGS The Top Fifty Classic Rock Songs of All Time - 1995. Jacobs Media. Retrieved on 2009-02-10. ↑ Riff of the Millennium - December 1999. The Guitar. Retrieved on 2009-02-10. ↑ The 500 Greatest Songs of All Time - November 2003. Rolling Stone. Retrieved on 2009-02-10. ↑ 1010 Songs You Must Own! Celebrity Choices - September 2004. Q. Retrieved on 2009-02-10. ↑ Standout Tracks from the 500 CDs You Must Own - January 2005. Blender. Retrieved on 2009-02-10. ↑ The 7,500 Most Important Songs of 1944-2000 - 2005. Acclaimed Music. Retrieved on 2009-02-10. ↑ Greatest Guitar Tracks The 20 Greatest Guitar Tracks - September 2007. Q. Retrieved on 2009-02-10. ↑ The 100 Greatest Rock Guitar Riffs - 2007. DigitalDreamDoor. Retrieved on 2009-02-10. ↑ Top 100 Singles - 1 January 1972. Oricon. Retrieved on 2009-01-19. ↑ Top 100 Singles - 29 January 1972. dutchcharts.nl. Retrieved on 2009-01-19. ↑ Hot 100 Singles - 12 February 1972. Billboard. Retrieved on 17 January 2009. ↑ CHUM Singles Chart - 12 February 1972. 1050chum.com. Retrieved on 15 January 2009. ↑ Top 100 Singles - 19 February 1972. Cash Box. Retrieved on 17 January 2009. ↑ Top 40 for 1972 - February 1972. Record World. Retrieved on 2009-01-19. ↑ RPM Singles Chart - 26 February 1972. RPM. Retrieved on 15 January 2009. ↑ Top 100 Singles - 6 March 1972. musicline.de. Retrieved on 2009-01-19. ↑ Top 40 Singles - 1 April 1972. Go Set. Retrieved on 2009-01-19. ↑ Top 100 Singles - 1972. infodisc.fr. Retrieved on 2009-01-19. ↑ Top 100 Singles - 7 March 1973. hitparade.ch. Retrieved on 15 January 2009. ↑ UK Top Singles - 18 November 2007. musicvf.com. Retrieved on 17 January 2009. ↑ Hot Digital Songs - 1 December 2007. Billboard. Retrieved on 17 January 2009. ↑ Hot Digital Singles - 1 December 2007. Billboard. Retrieved on 17 January 2009. This page was last modified 12:37, 1 May 2014.